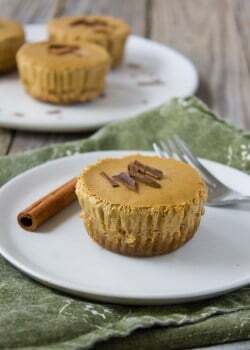 A holiday dessert worth cheering for! 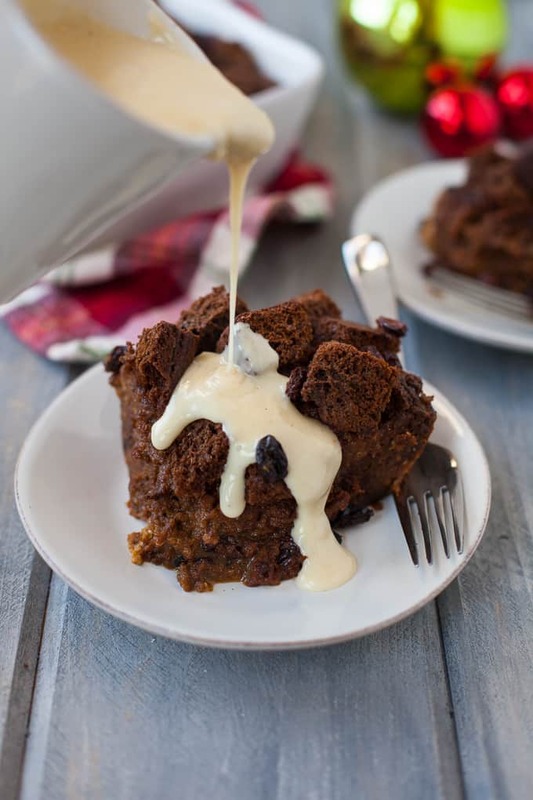 This gingerbread bread pudding is packed with whole grain goodness, sweet raisins and gingerbread spices, and topped off with a warm eggnog sauce. It’s the holiday season and whoop de doop…. I don’t know about you but it doesn’t really feel like the holidays to me right now. Sure, we decorated our tree and started doing some Christmas shopping but it doesn’t help that it was 50 degrees this week in Boston. It also doesn’t help when you’re not sure your 94 year old grandpa is going to make it to Christmas this year :(. Life doesn’t stop for the holidays. Suffering doesn’t stop for the holidays. So give yourself a dose of compassion if you’re not feeling the cheer cheer cheeriest this time of year when everyone is telling you you should. Know that you’re not alone. Last Sunday, we went to church and the priest was talking about how this season is really busy and we can get wrapped up in the whirlwind of all the stuff we have to do. But he asked if we can spend some time listening to our bodies, to our spirit, to see what we need. And I turned to Steve and gave him the look. That look was like OMG Father Unni is preaching what I preach! This time of year especially, we can forget to check-in with ourselves, with our bodies, to see what we need. But with all the stressors and commitments and obligations, it becomes that much more important to listen to the innate wisdom our bodies provide. And sometimes that innate wisdom is going to be like go get yoself a piece of bread pudding, guuuuurl. And so, I present you with a new and improved version of my gingerbread bread pudding. Are you a bread pudding fan? I adore the stuff. I can still remember the first time I tried it. I was at a Southern restaurant in NYC visiting my cousin for my high school graduation gift (my parents got us tickets to see Wicked). And I was like I will never eat another dessert ever again. Bread pudding is all that I NEED. I’m a sucker for warm desserts in the winter – warm apple pie, warm pear crisp, warm bread pudding – especially if they’re topped off with a scoop of ice cream 🙂 Gimme all the warm, sweet things. 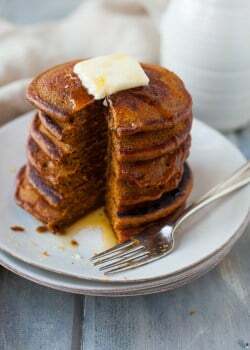 I also adore gingerbread during the holiday season as evidenced by my recent Gingerbread Pancakes post. 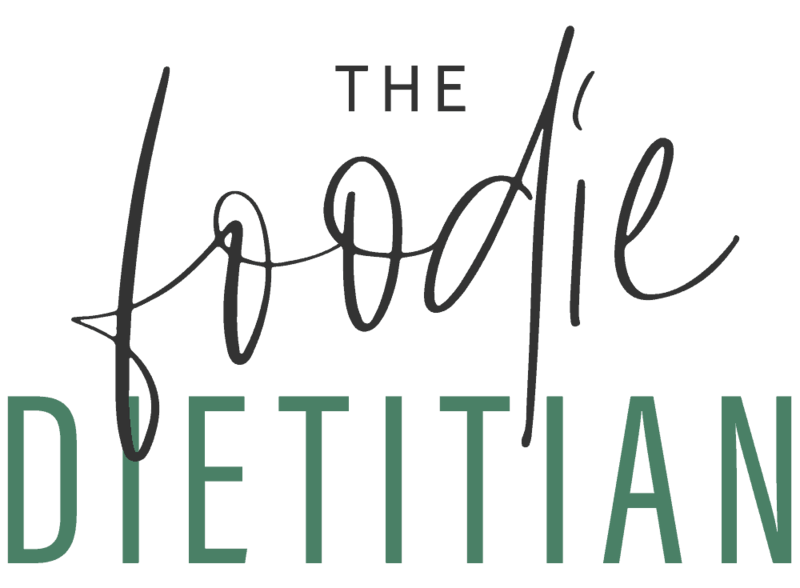 Ginger is a wonderful ingredient and has inherent warming properties so it’s good for us to consume more of it during the cold, winter months. And it’s great for our digestive systems too. 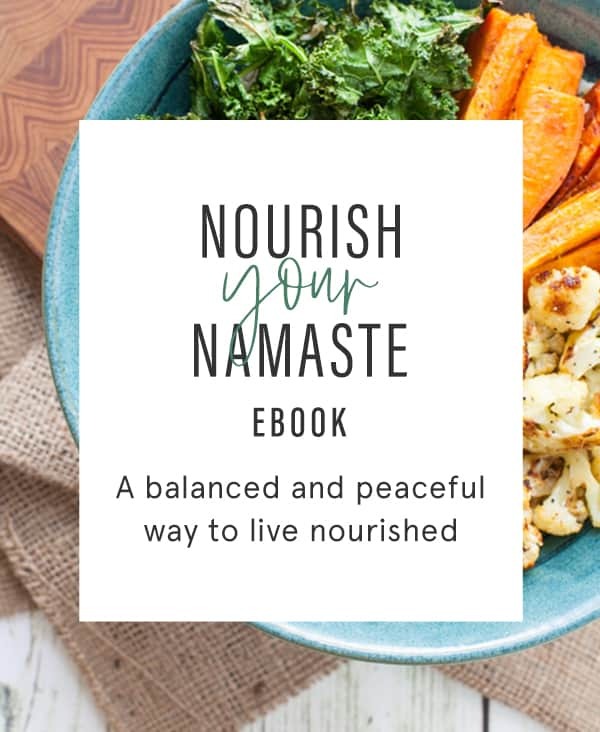 As I mention in Nourish Your Namaste, ginger has been shown to accelerate gastric emptying (how fast food leaves your stomach) and improve nausea and vomiting associated with motion sickness, pregnancy and chemotherapy. Plus, the smell of gingerbread baking in the oven? NOTHING like it. I need to find me a gingerbread candle. Or, just keeping baking all the gingerbread things. 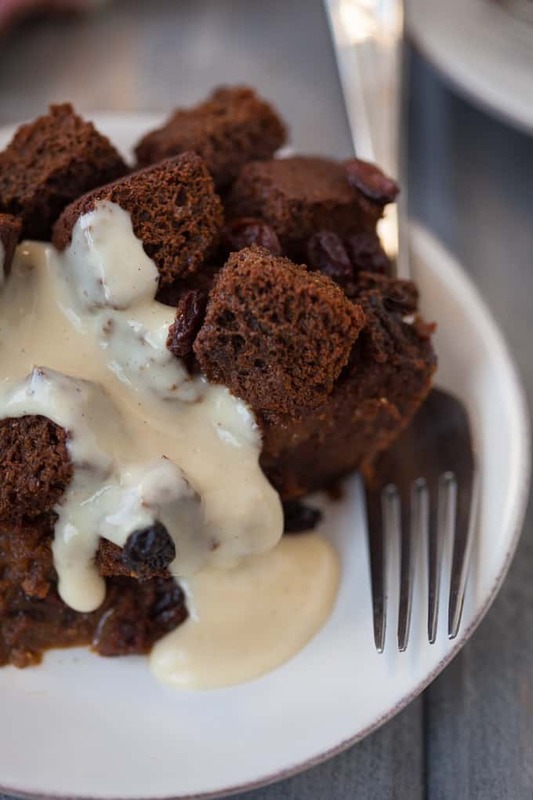 Oh, and as if gingerbread bread pudding could get better, it gets better. I topped it off with a warm eggnog sauce. YAH WELCOME. Ok, so now you have one less thing to worry about for the holidays. Dessert is covered. Preheat the oven to 350 degrees. Lightly grease a loaf pan with butter. In a medium mixing bowl, add flours, baking soda, salt, and spices and stir to combine. In a large mixing bowl (or stand mixer), beat butter and molasses until combined. Add eggs and ginger and beat until combined. Alternate adding flour and buttermilk to the wet mixture, a little at a time, so that you begin and end with the flour. Stir until combined. Transfer the mixture to the loaf pan and bake for 45-50 minutes, or until a toothpick inserted in the middle comes out clean. Turn out onto cooking rack to cool completely. Cut loaf into cubes to let dry out overnight. Transfer cubed gingerbread to a large baking dish. In a medium bowl, whisk eggs, milk, sugar, and vanilla until combined. Pour wet mixture over bread into the baking dish. Sprinkle raisins over top. Bake for 50-55 minutes or until pudding has set. Let cool for at least 10 minutes. Serve warm with eggnog sauce. In a small saucepan, whisk together sugar, cornstarch and salt over medium-high heat. Slowly pour in eggnog, whisking constantly. Whisk frequently until sauce comes to a boil and thickens. Serve warm with bread pudding. If using ground ginger, add it to the dry ingredients. This recipe was retested, reshot and revamped to bring you the most delicious (and most beautiful) dish! The original post was published December 2014. What’s your favorite holiday dessert? See below for more gingerbread infused goodness. This is perfect for a holiday table! The finished product with some ice cream or whipped cream looks unbelievable! Love gingerbread. ohhhh my Kayla! 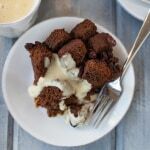 I have a gingerbread chiaseed pudding recipe on my blog, but this takes it to a WHOLE NEW LEVEL. An incredibly yummy level I might add 🙂 This looks amazing!! OMG this looks INCREDIBLE!!! Ever since my family went to New Orleans when I was in middle school I’ve been a sucker for good bread pudding…100% making this version this holiday season!! Bread pudding is definitely my favorite dessert too! Hope you enjoyed!! 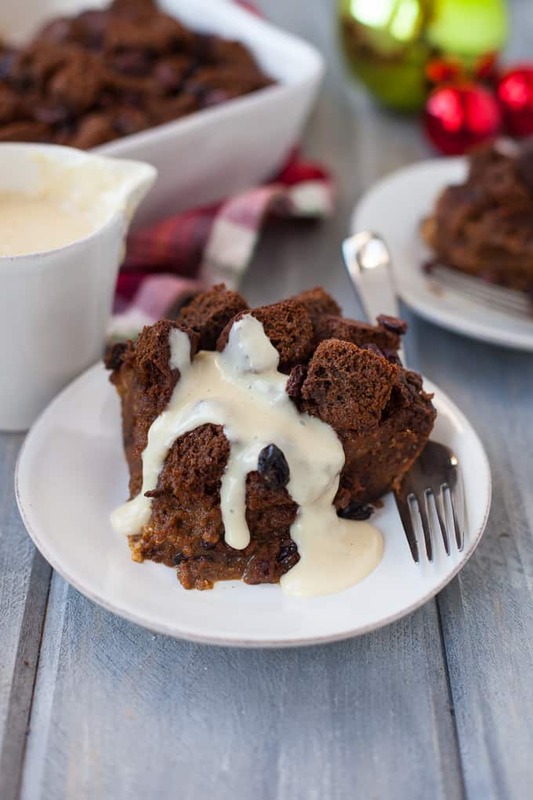 I find that gingerbread can often be susceptible to drying out- but- you solved this problem by making a bread pudding- love it! I’m going to have to try this- thanks! Yes! Took advantage of the whole drying out process :). Enjoy! This looks A-MAZ-ING! Bread pudding is pretty much my go-to dessert when dining out- if it’s on the menu, I’m ordering it. I’ve never had one which gingerbread but seeing yours, I really wish I had! Thanks, Sonali! Mine too – LOVE all the bread puddings. Haha I’ve been tempted, Alanna!! This looks amazing! 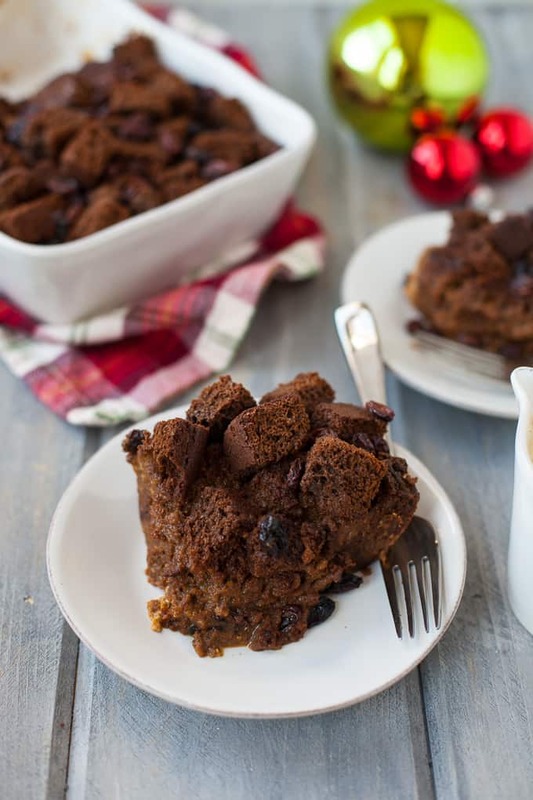 I haven’t has bread pudding in a long, long time, but I am seriously tempted to make a gluten-free version of your gingerbread pudding. Delicious idea! Thanks, EA! I love love love bread pudding. Let me know how the gf version turns out if you make it! 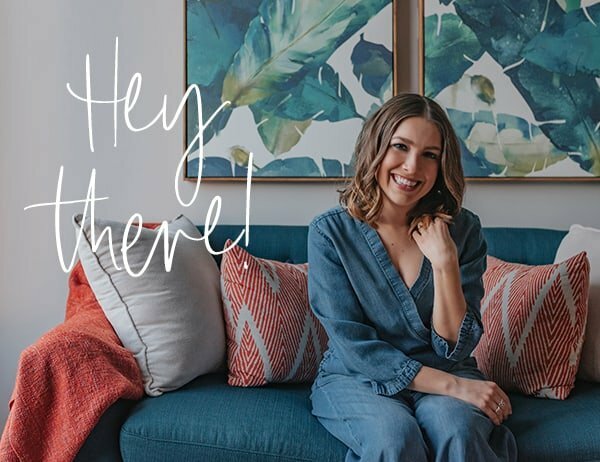 Your photos are gorgeous, and I know the bread pudding will taste even better than it looks (if that’s even possible)! So many of my favorite ingredients wrapped up into one healthy dessert. Pinning now!! Nothing makes a house smell better than gingerbread when it’s baking. 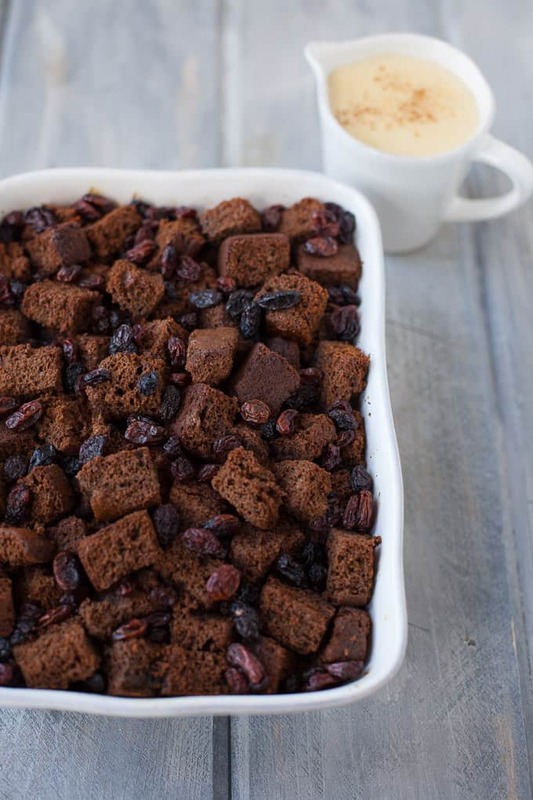 I love bread pudding, and this recipe looks incredible. That last picture makes me want to reach into my computer and grab that fork! Thanks, Linda!! I wish had gingerbread baking 24-7 this time of year. 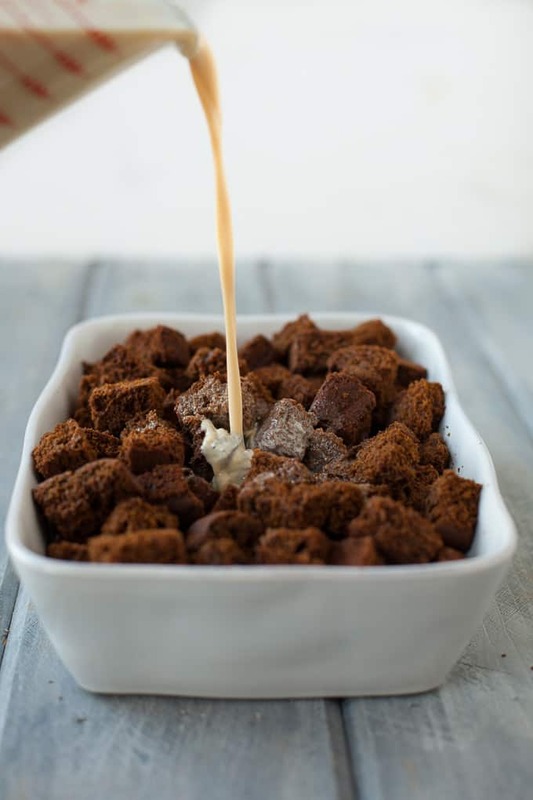 AHHH – you have combined my two loves – gingerbread & bread pudding 🙂 I just made some gingerbread muffins last night – might need to hold onto some and make bread pudding out of them (or just eat them and make your recipe from start to finish. Pinning now. Hahaha just eat all the gingerbread. Sounds like the best option to me! Wish we could do a gingerbread swap! I could so go for one of those muffins right now!